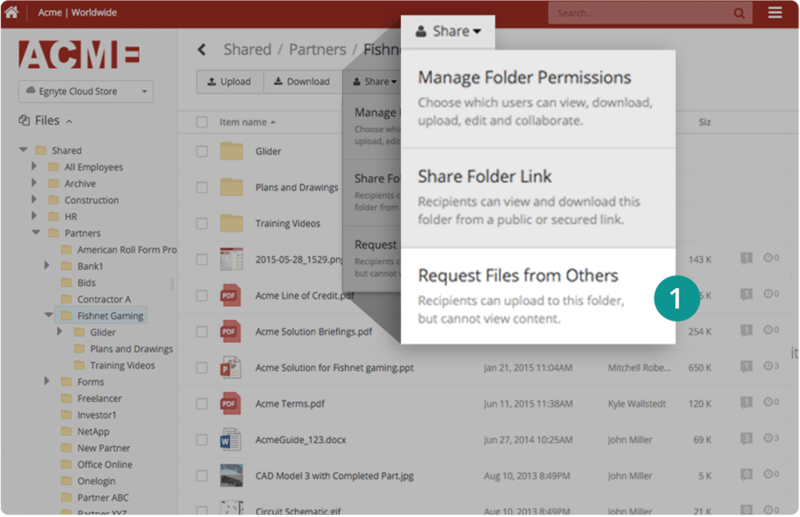 Safely sharing files with customers, suppliers and partners can be challenging for many companies. 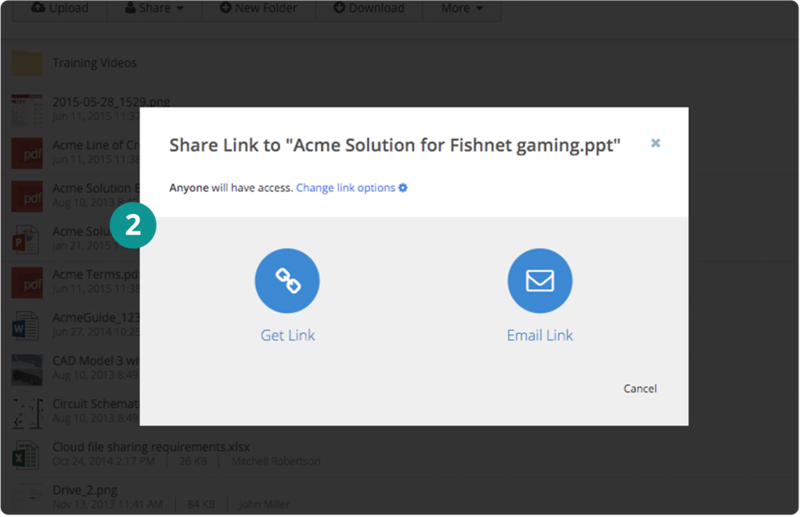 Egnyte online file sharing combines the ease of use and flexibility both employees and partners want along with the security, visibility, and control IT needs. Secure, easy collaboration – Mitchell, a marketing manager from a high tech company, needs feedback from business partners on a marketing campaign. He needs to be able to securely access and share the files from his smartphone, tablet or laptop computer. Using Egnyte, Mitchell is able to share the campaign documents with the business partners via a secure email link. 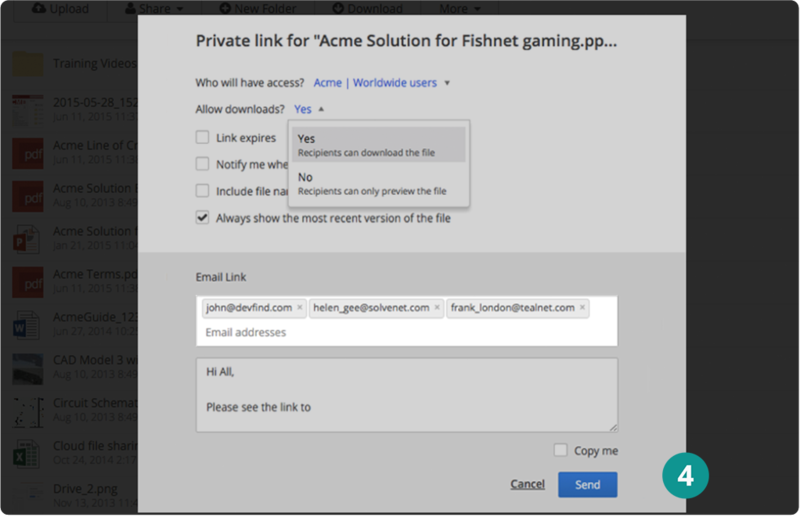 He configures the link so that the partners can access, view and download the files from various devices. 1Mitchell hovers his cursor over the file, and clicks on the “Share” button. 3Mitchell selects options where partners can view and download the file. 4Mitchell enters the name of each recipient. He selects “Send” to send the email. Seamlessly collect and organize information – Mitchell wants to receive RFPs from vendors in a secure, well-organized file folder. Collecting RFPs via email or fax can put information at risk. 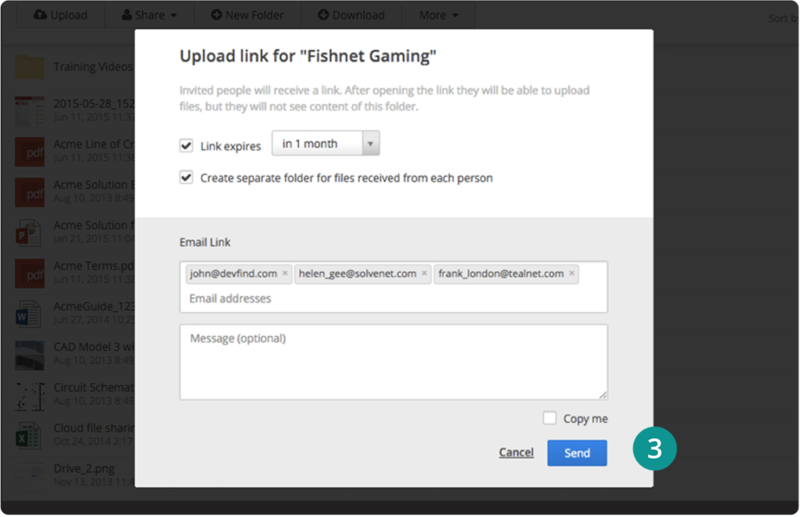 Mitchell uses the Egnyte Upload Link feature to request the RFPs. 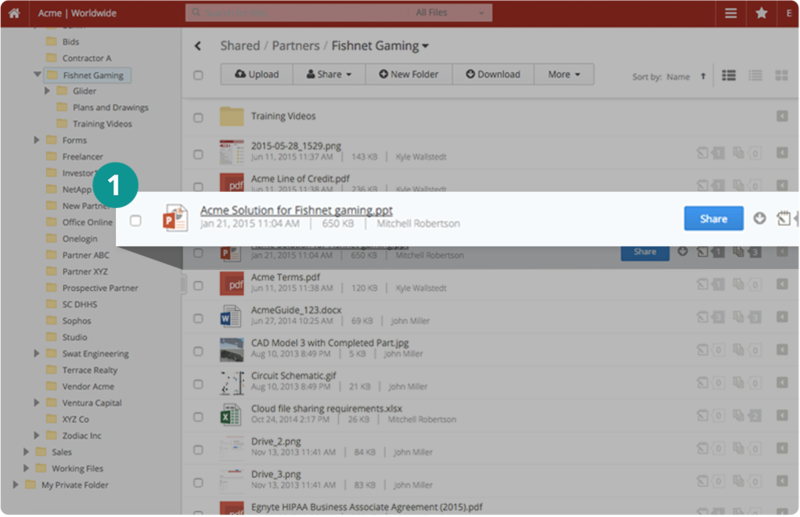 As each vendor uploads their file, the files are organized into secure separate per vendor folders. The information in the uploaded files remains confidential, as the vendors are not able to see what others have uploaded. 1Mitchell selects the “Share” dropdown menu and then selects “Request Files from Others”. 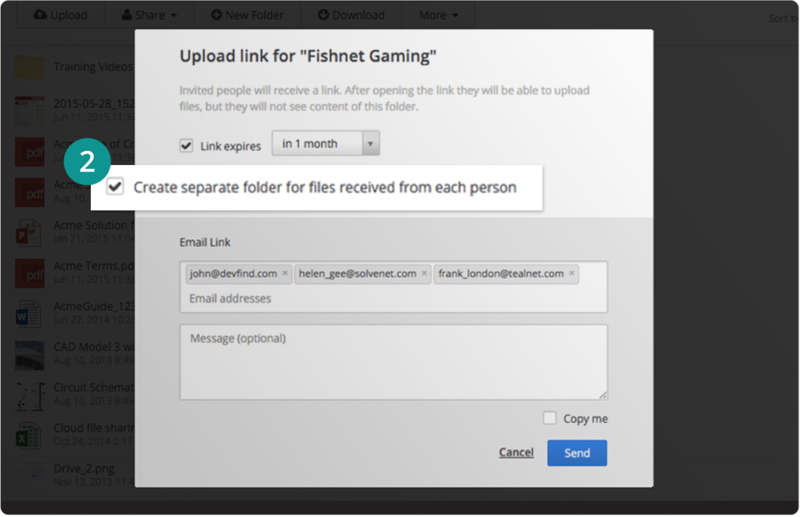 The “Upload Link” window appears. 2He selects “Create separate folder for files received from each person”, and then types in the names of each recipient. 3He sends the email to the vendors. And he will receive an email notification each time a vendor uploads a file. Collaborate at anytime, from anywhere – As the foreman for a construction company, Jane travels from site to site, and must be able to collaborate when she’s on the go. Jane travels with a mobile phone and a tablet. 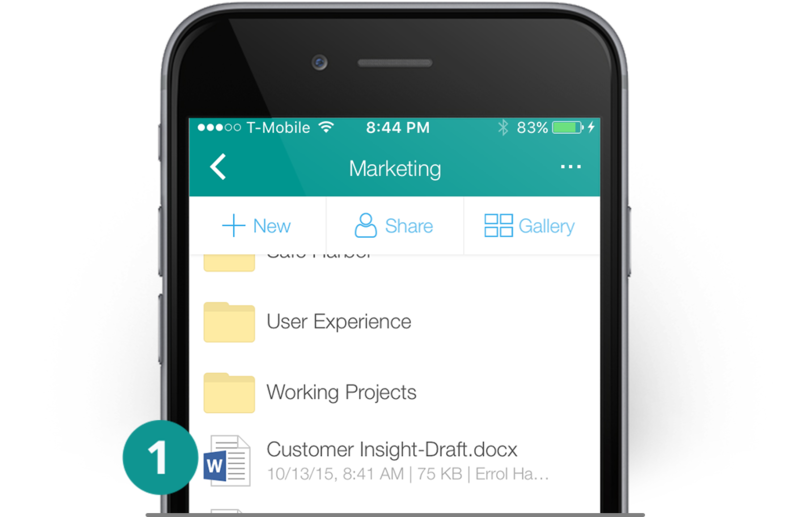 With the Egnyte mobile app, she is able to access her shared company files, in the cloud and on premises regardless of where they are physically stored. 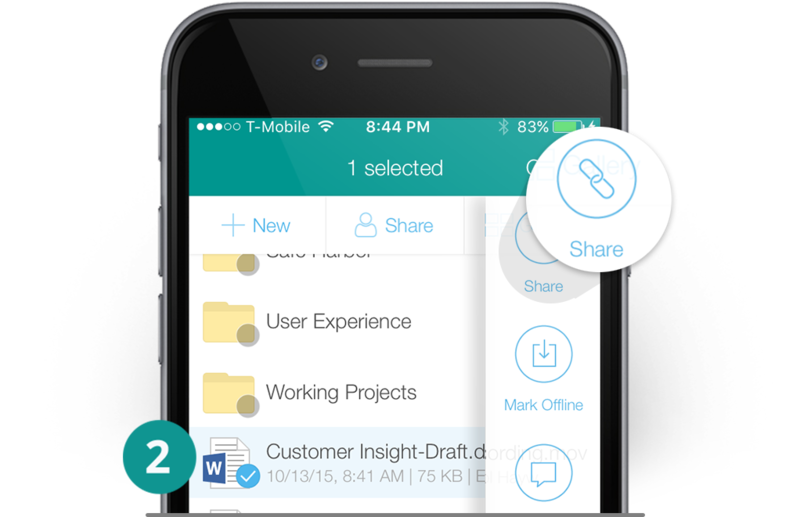 Jane is able to securely access, edit, and share files or folders from iOS, Android, or Windows Mobile devices. 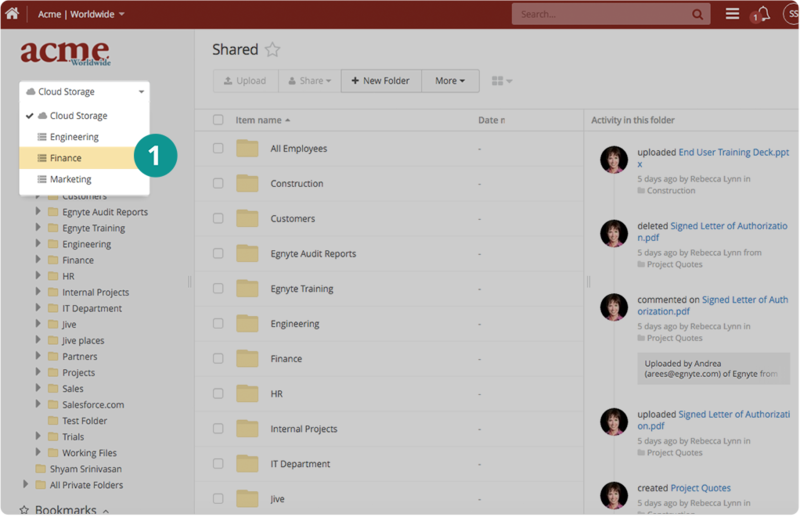 Keep sensitive files secure – Eva, a CFO of a high-tech company, is out of the office. 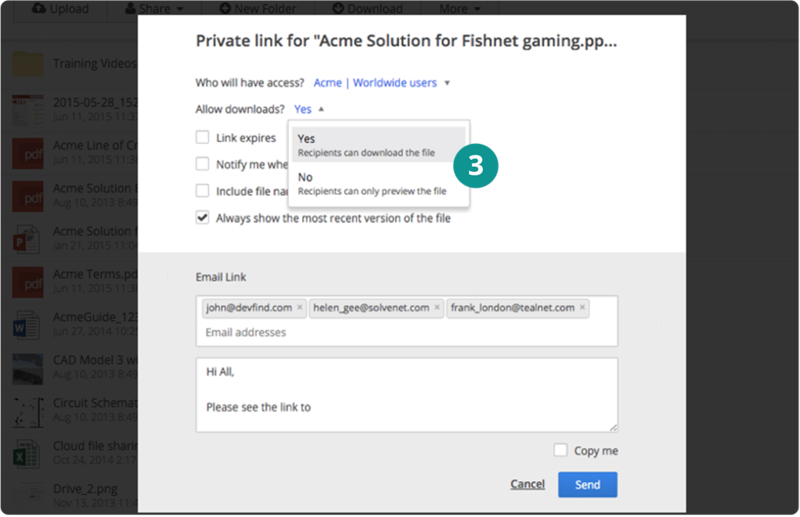 Using Egnyte Storage Connect, Eva is able to remotely access, edit, and share on-premises confidential documents using password protected links. Neither the file nor its meta data ever goes through the cloud. 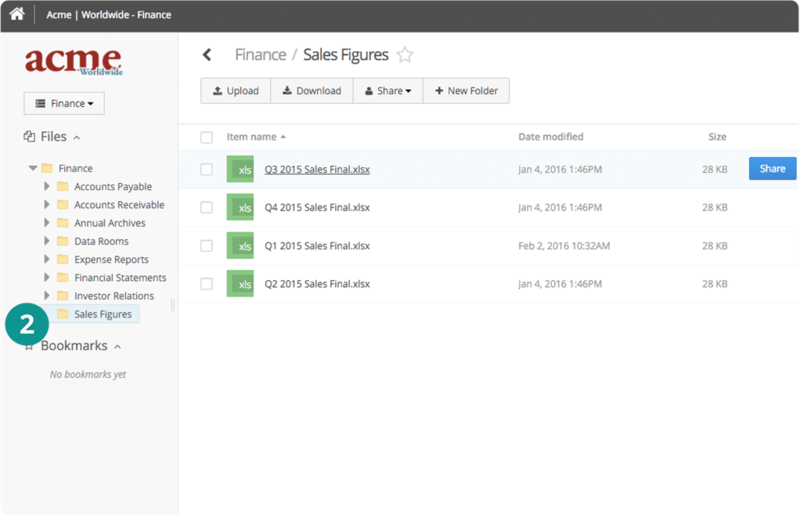 1Eva gains access to the on-premises document by clicking on the file shares dropdown menu. 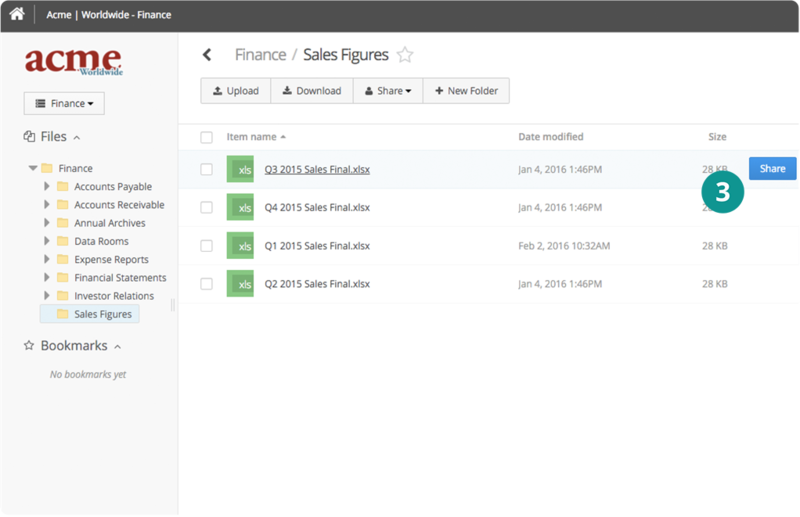 2She clicks the Sales Figures folder, to see its contents, and selects a file for editing. 3Once the edits are complete, Eva selects “Share” to generate a link. 4The link is configured with an access password, expiration, and notification when clicked. 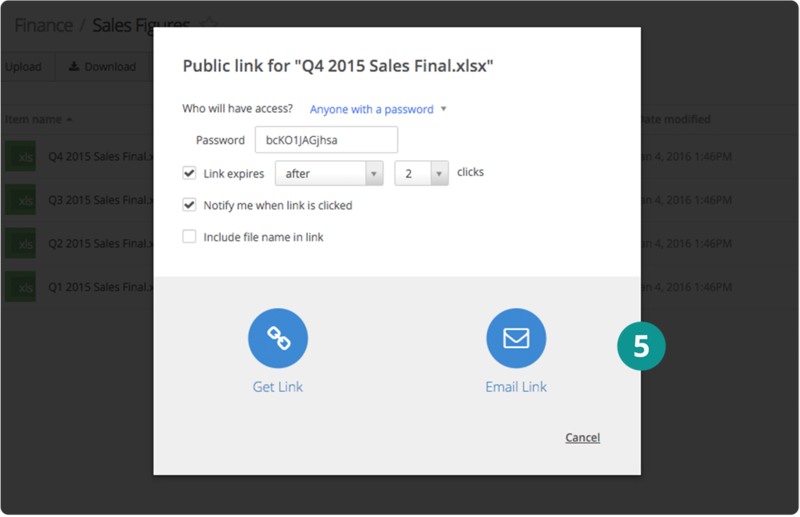 5Eva selects “Email Link” to generate the link and send a secure email. Always know what’s happening with company files – As an IT admin, Susan creates a secure, flexible, and scalable environment while having more visibility and control over how employees access and share files. Using Egnyte Smart Reporting & Auditing, Susan is able to optimize policies and procedures around company security requirements, and gain insights into usage patterns using system-wide analytics. 1Susan chooses “Settings” from the top bar dropdown menu, and selects the “Configuration” tab. 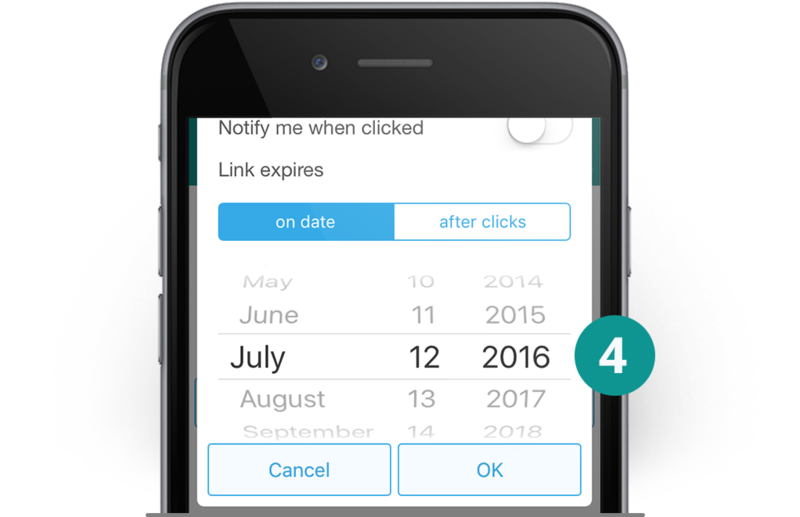 2 She can set password requirements for users, defaults for link sharing, link passwords, link expiration, and much more. 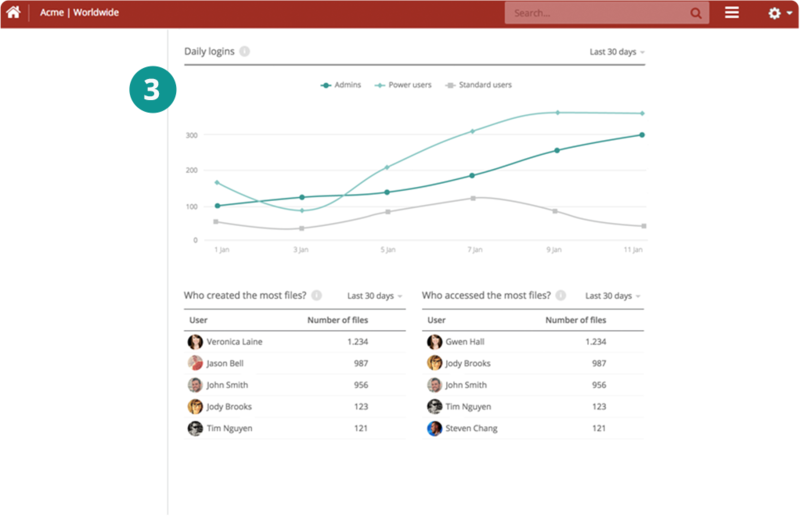 3Susan then selects the “Reports” tab, where she can view user activity, storage and device information in real-time.